These were turbulent, even dangerous times, as his kingdom struggled with the other two of that time for supremacy in Ancient China. In later life Ruǎn Jí survived for as long as he did by often adopting the persona of an eccentric, or a drunk, thus appearing to pose no threat to anyone. However, there was much rivalry between the different clans and families who all struggled for stability amidst constant political upheaval. He grew up, despite the difficulties, during a period of burgeoning spirituality with new influences coming from abroad, such as Buddhism, and many such as Ruǎn Jí exploring the art of lyrical poetry. Artists were creating fine pieces of work, both on canvas and in new architecture, and an overwhelming spirit of “grace and freedom” could be enjoyed by many during this exciting epoch. Curiously those of the peasant class were often seen as symbols of purity while those who plied their trade in government or royal court circles were said to live their lives in the “dust and dirt”. Ruǎn Jí and his fellow writers of the “Bamboo Grove” often gathered together in a house in Shanyang to swap ideas while freely imbibing alcoholic drinks, and experimenting with narcotics such as a fairly toxic substance called Cold Food Powder. This, combined with the playing of spiritual music, would create a strong feeling of well-being, at least in the short term. These sessions did, however, encourage the creation of poetry, verses that were often inspired by the idea of freedom and the quest for a better world. Officialdom looked down on groups such as this but the members of the Seven Sages of the Bamboo Grove spurned such concepts of public service, in favour of living a life that avoided politics altogether where personal enjoyment and freedom were much more important. It seems that in writing such lines he could turn the sadness of death into something more hopeful, simply by describing a pretty flower. Music was becoming more and more important in the China of the 3rd century and Ruǎn Jí saw in music an “ideal of harmony”. For him, music was as nature – all around, all powerful and capable of taking a person into a perfect state of harmony and serenity. 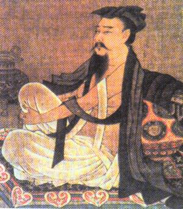 It is believed that Ruǎn Jí died at the age of 53, sometime during the year 263.